Summed up by Raven in his post “Welcome to Bleak Valley”, and the subject of the second half of our podcast. Long story short: Elizabeth is an abused only child and everything that happens in the books is all in her head as a coping mechanism. Wing, Raven and Dove talk about Sweet Valley Twins 24: Jumping to Conclusions; Super Edition 2: Holiday Mischief; and 25: Standing Out. They also discuss Bleak Valley and how these books tie into this theory. Wing, Raven and Dove talk about Sweet Valley Twins 21: Left Behind; 22: Out of Place; and 23: Claim to Fame. They also discuss Bleak Valley and how these books tie into this theory. 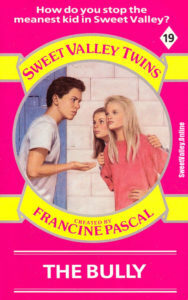 Wing, Raven and Dove talk about Sweet Valley Twins 13 Stretching the Truth; 14 Tug of War; and 15 The Older Boy.